The final of the 2011 Association of English Singers and Speakers Patricia Routledge National English Song Competition was held in the Peacock Room of Trinity Laban Conservatoire of Music and Dance on Wednesday 25th May. Thanks are due to Linda Hirst, Head of Vocal Studies and Sarah Roseblade for all their help. Stephen Miles co-ordinated the event and also selected the finalists with Marian Lines. The Panel of Judges for the final was Eiddwen Harrhy, Richard Suart and David Williams. 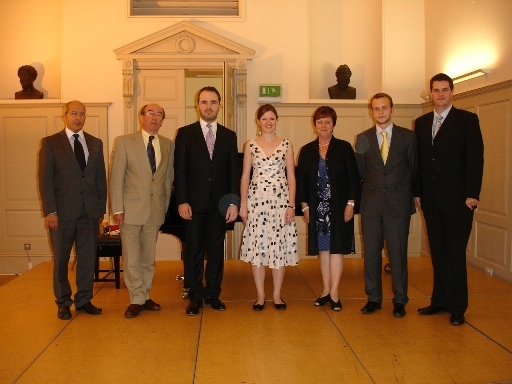 Left to Right: David Williams, Richard Suart, Samuel Evans, Catherine Backhouse, Eiddwen Harrhy, Jamie Thompson and Ben McAteer. The first prize of £2000 was won by Samuel Evans, a baritone student of Russell Smythe at the Royal College of Music. The runner-up winning £1000 was Catherine Backhouse – mezzo soprano, a student of John Evans at the Guildhall School of Music and Drama. Also winning £1000 were third-placed Ben McAteer – baritone, who studies at the Guildhall with David Pollard, and the pianist Jamie Thompson from the Royal Northern College of Music. The AESS is most grateful to Patricia Routledge CBE for her continued support of this competition. This entry was posted in Past Events on May 25, 2011 by AESS.